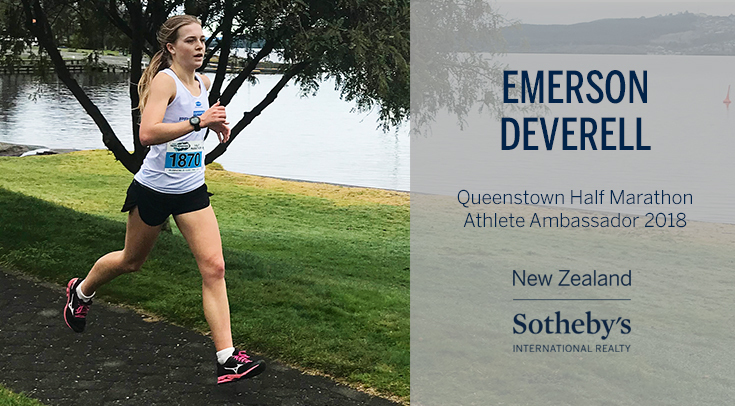 New Zealand Sotheby's International Realty is excited to sponsor a number of Ambassador Athletes competing in the Queenstown Half Marathon, Saturday 17 November 2018. 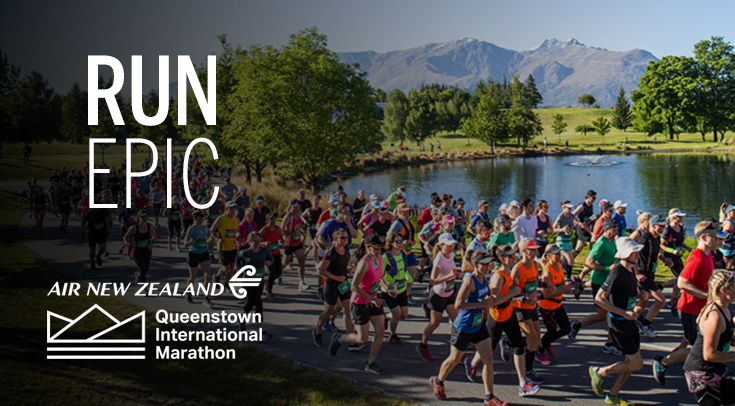 The ambassadors won their categories in the 2017 Queenstown Half Marathon and are returning again this year to defend their title. Our athletes are a mix of competitive and recreation runners and walkers, from small business owners to university students from all parts of New Zealand. Meet Emerson Deverell, Half Marathon competitor from Cambridge. When not studying Economics and Finance at university, she's running competitively and for fun. Emerson has represented New Zealand in Australia, Hungary, Italy and Bulgaria for cross country and mountain running. She's also won national medals in multiple running disciplines and taken home two New Zealand road titles. All of this in just five years! A. When it comes to race day I just tend to remind myself that the hard work has already been done and to do the best I can. Going into a race with a plan also helps, so you know how you are going to race. Quite often I like to run within myself for the first half and try to increase the intensity for the second half. A. I have always loved being outdoors, and find going running the perfect chance to relax each day. No matter where you are in the world you can find new and exciting places to go running. Q. What was it like to win your category at the New Zealand Sotheby's International Realty Half Marathon last year? A. I was super happy to win the Under 20s last year and it was a personal best for the Half Marathon. I hadn't done many half marathons before, so I wasn't quite sure what to expect but I was really happy with the result. Introducing Athlete Ambassador, Hayden Zervos. 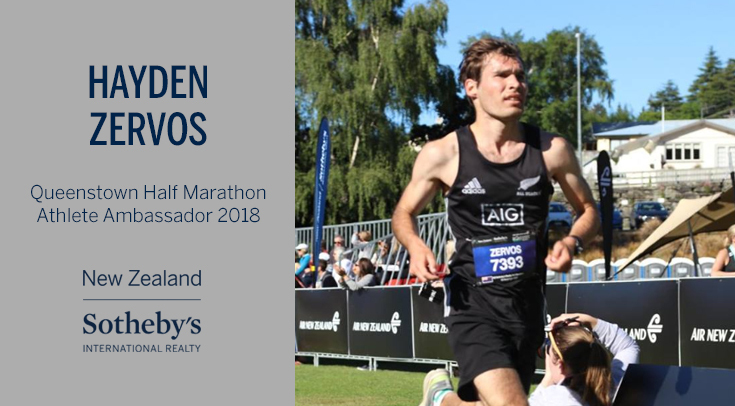 Hayden won his category at the New Zealand Sotheby's International Realty Queenstown Half Marathon last year. Hailing from Christchurch, Hayden started running marathons at 16 years old and won his first marathon in the M20 category in 2017. He's studying at the University of Canterbury and loves running to relax, stay healthy and meet new friends. Q. ​​What motivated you to start running? What keeps you motivated? A. ​I started running mainly because I needed a energy outlet. It also helped me relax and stay healthy. These are still the main reasons I run but running has also helped me meet new people and friends to run with. A. A good build up before the event is the most important thing but being well rested and energised before racing also helps. I usually have something high on carbs like spaghetti or pizza the night before racing. Q. How do you recover straight after a race? A. I usually try to do an easy slow jog for 10-15 minutes, do a few stretches and try and eat a banana of some other fruit within 10 minutes of finishing.